I enjoy drawing patterns for Putz houses. Today I picked two pictures from my Putz Pinterest board and drew patterns for them, in prep for my friend’s visit tomorrow. We are going to putz all day! 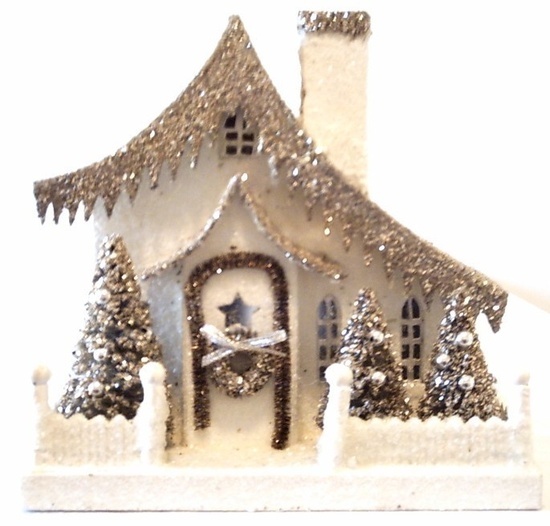 This little glitter house reminds me of Dr. Seuss. I am developing ideas for making a Dr. Seuss style Putz house village. 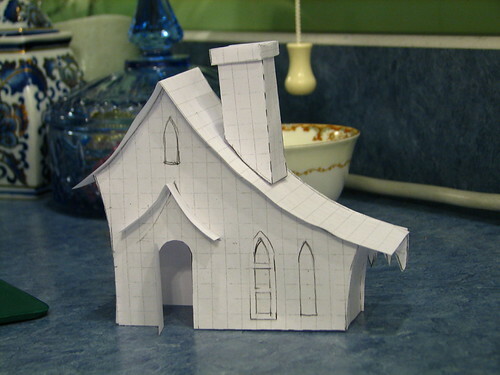 When I draw a new pattern, I like to build the house in paper before making it in heavier card stock. I can check to be sure it fits properly and that all the pieces are right before investing time in a more permanent piece. When finished this little house will have icicles all the way around the roof. The other pattern I drew was for this house. It had more detail than the first house, but the pattern came together pretty well. I left the dormer off the roof, but I think I’ll go ahead and add it tomorrow. I’m looking forward to a fun day of putzing! This entry was written by ~~Rhonda, posted on March 8, 2013 at 10:38 pm, filed under Putz / glitter houses. Bookmark the permalink. Follow any comments here with the RSS feed for this post. Post a comment or leave a trackback: Trackback URL. Your houses are beautiful Rhonda! I am just beginning to put together my own little putz village. I would love to add these. Any chance I could pay you to send me the unfinished houses in pieces. I enjoy the decorating, painting, etc., but I’m not very good at putting the plans together, so I have been purchasing kits when I can find them. How do I avail myself of your tutorials? I want to start making putz houses but don’t know how to start. Is there a book out there with basic instructions? Also, what type of mica flakes do you use? Pearl, starlight, iradescent??? Thanks, love both of your new houses. These putz houses are beautiful. 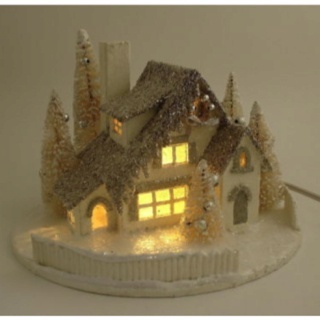 I can remembers my grandmothers little glittery houses and would love to make one. I am wondering if you would consider selling the pattern/templates. 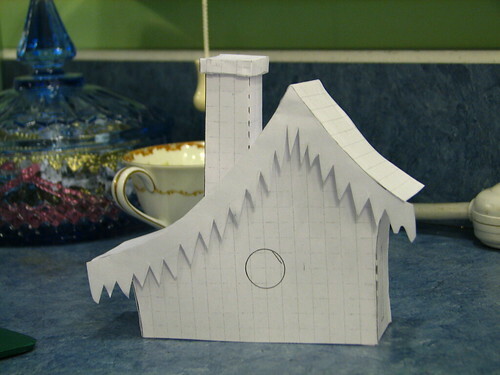 Puddin, check out the website cardboard christmas, there are designs and loads of tips on making putz houses. Love the houses! Can you please scan your drawings and share them? Let me know if you do, and I’ll put link to your site and project on my blog. Thanks! GORGEOUS creations and the tutorials are fantastic. I’m planning on making Putz houses as placemats for a few guests in Mid-January, so everything I can find about them is most welcome. KEEP UP THE GREAT WORK and thanks for sharing it! Great looking Putz Houses, Rhonda! If you ever decide to work up a template/tutorial for the two houses you’ve got featured on this page I too would appreciate it. I realize it’s a lot of work so am willing to purchase it from you as well. Thanks for sharing! also would love the pattern and instructions and am willing to pay for them. Great and beautiful work! Do you sell your patterns? I would love to have a source for such a great design. What r the finished sizes? Do. U ever put them together and sell them that way? I would be very interested. Where can I get putz patterns? I make gingerbread houses and I love love love these houses. How Can I get this patern? I love your houses also and would love to buy patterns or cut outs. Would you consider doing that? These particular patterns are not for sale or available as they are drawn for my own use from commercially available Putz houses. However, I am happy to make a pattern from a vintage house of your choice. I would need a picture of the desired house. Patterns from vintage houses would be made available in my Etsy shop. I hope to have some available this month. I’m still working on that. I would be happy to sell a pattern for any of the Putz houses in my Etsy shop, if you see one there that you like. I’ve drawn all those patterns from vintage houses or my own imagination. Price would be $5:00 for the pattern. It would not include embellishments. 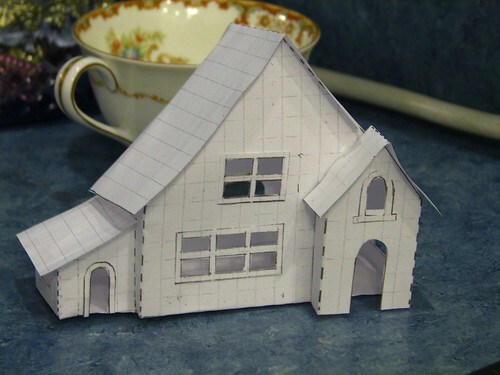 I have several tutorials for making Putz houses, bases, fences, etc., that would be helpful if you haven’t tried making one before. Please ask if you have any questions, at all. I am happy to help. Note: All proceeds from my crafting, including my Etsy shop, support aid and ministry to children and their families in the largest slum in Africa. I appreciate the support from my customers in helping these children who are in such great need.